Posted on 25 May, 2017 . Attractors and Boundaries: Invitations should have an attractive purpose at their centre, but also give a sense of the ‘container boundaries’ into which you are inviting people. What’s NOT part of this? Leadership: To invite is to lead, and following through on an invitation requires great leadership. Urgent: What’s the zeitgeist to which you are responding? What’s needed right now? Embodied: Invitation are person-to-person, and inviting is a whole-body sport where people see your enthusiasm and reactions close-up (so they’d better be congruent and convincing). This all adds up to the VALUE of a great invitation! Here at Host Leadership we’re right behind this way of thinking and acting. We might add the importance of making the invitation Acknowledging of the person being invited, bringing out not only the attractiveness of the purpose but also the reasons why THIS particular person is being invited – what are we hoping they can bring to the ‘party’ in terms of experience, strengths, outlook or whatever. And remember, all invitations have an element of Choice about them – in order for there to be a heartfelt ‘Yes’ in response, there has also to be the possibility of ‘No’. I particularly admire Chris Corrigan’s work on containers and boundaries, and it’s very interesting to see this kind of language included in the vocabulary of an invitation. Great stuff Chris! Chris is coming to Scotland soon to run a two-day workshop on ‘Working In Complexity’ in Glasgow with our own Bronagh Gallagher later in the year (perhaps November 2017) so there is a chance for UK folks to experience his excellent and skilful work in person. Now please go check out Chris’s blog if you haven’t already – http://www.chriscorrigan.com/parkinglot/the-value-of-invitation/. 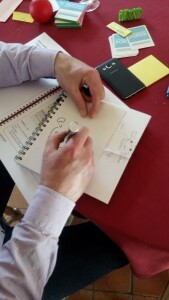 Use a Visitors’ Book at your trainings or workshops – better than feedback forms! Posted on 13 March, 2017 . I was contacted by Paut Kromkamp, a Dutch colleague, last week. Paut is a keen follower of Host Leadership ideas, and had started with the idea of using a Guest Book (in Dutch Gastenboek, or in French le livre des invités) in her trainings, to allow participants to leave their names and record some comments about their experience. I had never heard of this idea, and on reflection I think it’s a fantastically useful development. A Guest Book – we might call it a Visitors’ Book in colloquial English, though terminology varies – is traditionally found in country houses or perhaps at some museums. It’s a book available to the public to sign their names and therefore record their visit, and perhaps add some words about their stay and experience. Often, of course, these words are positive and enthusiastic – not many people want to go publically on the record expressing their distaste. I have been thinking about the possibility of using a Visitors’ Book as part of the furniture at training courses. As part of the host leadership philosophy it’s nice to respect guests and offer them a chance to ‘make their mark’ in some way. And of course it’s a very different way to solicit remarks than the traditional way after a training course or workshop – the dreaded ‘feedback form’ or evaluation sheet. These are popular with trainers (though usually not with trainees) as a way of gathering comments and feedback about what people liked and what they didn’t, ostensibly as a way to improve things next time. Let’s compare and contrast the way these two options – the Visitor’s Book and the Feedback Form – work in practice. These two forms clearly have different purposes and possibilities. If one really wants to get feedback and criticism, then having a private Feedback Form is clearly one way to go about it. (Another might be to quietly ask people about their experience, and be genuinely interested in what they have to say!) 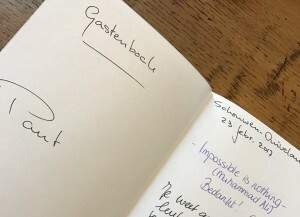 A Visitors’ Book, on the other hand, is a very different offer – the chance to publically record one’s presence and reactions, in the knowledge that they can (and will) be read by future visitors. This is less about gathering comments about the shortcomings of the chairs or the temperature of the room. It’s much more about inviting people into a kind of community of those who have passed this way, want to acknowledge that and stand up to recognise the efforts of their hosts in the process. Once upon a time I visited the training centre of systemic coach Sonja Radatz in Vienna. Piled up at one end of the room was a series of red cubes, perhaps 35cm on each side, each of which was signed by guest trainers who had delivered seminars there. Ms Radatz had entertained many of the greats of systemic thinking and management – Peter Senge, Diana Whitney, Humberto Maturana, Matthias Varga von Kibed… (these are household names in the world of systemic thinking, if not perhaps in wider society). And imagine my delight, as a relative newcomer to that field, to be asked to add my own signature to my own cube, to be placed on the pile with the rest! This is a form of Visitors’ Book in that it’s a lasting reminder of who else has been this way, and sets an exciting extended context for what might happen next. So, imagine going onto a training and being able to leaf through and see who has joined in the past, what they thought, how long it’s been going, what kind of people have been here, how things have evolved… All this is possible with a Visitor’s Book, but not at all with a Feedback Form. Of course, it’s quite possible to use both these methods. It would be amazing to see in years to come that the Visitor’s Book might become just as much part of the training/workshop scene as the Feedback Form – perhaps a more loved and treasured part? In some ways that wouldn’t be difficult. Be led by local terminology and tradition. In France a ‘livre des visiteurs’ does not resonate with people, but a ‘livre des invitées’ does. To help people get going, it might be worth inviting them to write something like a reflection or invitation for those who might come on future events, and will therefore see the written ideas. As hosts for an event, we can also use the book to record our own reflections, thoughts, gratitudes, and as part of our own history and connection with our work. Get started today. Laurent did – you can see one of his trainees completing their book on the right. This is a great way to build learning, refection and communication with your learners and customers. Posted on 28 February, 2017 . I’m a big fan of economist and writer Tim Harford’s work. Tim has a column every week in the Financial Times as the ‘undercover economist’ and has written several excellent books about how economics applies in the real world. His recent piece on ‘Why every office should scrap its clean desk policy’ for TED caught my eye. 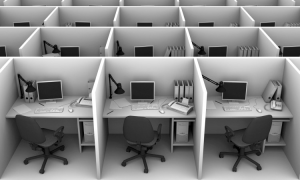 Most of us have experienced a clean desk policy at some point – where the company insists that everything is removed from desks at the end of the day and personal effects like photos are limited or even banned. 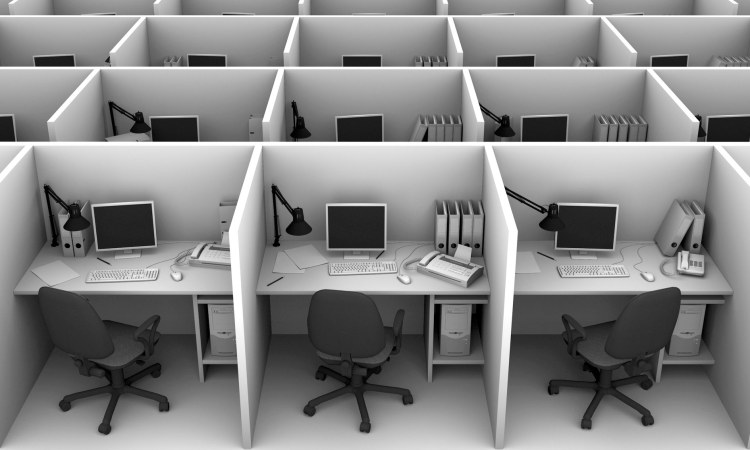 Harford reports on experiments at the University of Exeter in the UK which study the connection between productivity and workspace. It turns out that people who are allowed to decorate and personalise their workspaces can be some 30% more productive than those where a clean desk policy is enforced. That’s a HUGE figure – like an extra day-and-a-half a week! Harford writes about the difference between ‘hard’ spaces where clean standards are rigorously enforced and ‘soft’ spaces where personalisation is permitted encouraged. This connects with the Host Leadership concept of the Space Creator role. One of the key elements of leading as a host is to take care in creating spaces which support the kind of interactions you wish to encourage between people. The work reported by Tim Harford shows not only how environment and space really makes a difference in how people work, but that an giving them a role in creating it, decorating it and maintaining it can add to its effectiveness. The importance of space and creating an effective space is hardly ever discussed in most leadership work – but from the Host Leader perspective, it’s clearly vital and a key element for the leader to consider. Now – read Tim Harford’s piece and even get hold of his book ‘Messy: The power of disorder to transform our lives’ from which this work is taken. Posted on 26 January, 2017 . I was contacted recently by Sonia Mayor, who was interested to combine host leadership ideas with her work in the area of restorative practice. I wasn’t familiar with that field, and have been investigating – and it looks like a very interesting connection with great potential. I had heard of restorative justice – my friend Lorenn Walker in Hawaii uses Solution Focused therapy ideas in the furtherance of this, which is about getting offenders to get involved in repairing the harm done and building relationships with victims and others, rather than simply being punished. These ways of working echo practices from many indigenous traditions, including native American, African, Asian and many others. In an extension of this philosophy, restorative practices are about applying similar thinking proactively rather than simply reactively – acting before offences are committed, to build community and connection in ways that reduce offending. 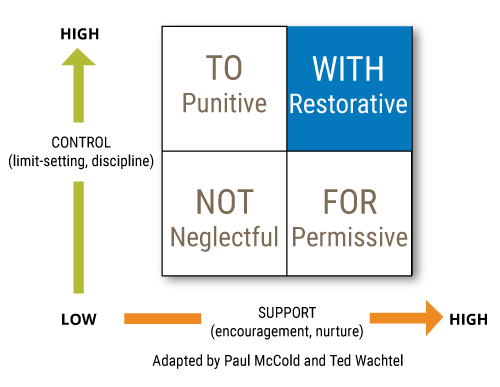 One key element of restorative practice is shown by the ‘social discipline window’. This model reflects the work of Australian criminologist John Braithwaite, who argues that conventional punishment stigmatises offenders and pushes them out of the community, rather than drawing them in. The social discipline window (right) shows four different ways of acting with offenders (and indeed with people in general) based on varying levels of control and support – not acting, acting for, acting on, and acting with. 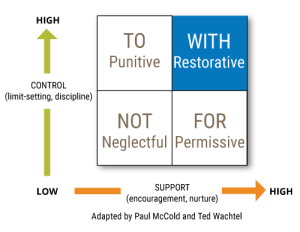 Restorative practices are very focused on doing things WITH people – combining high degrees of support and control. It’s easy to see how there are dangers of slipping into the neighbouring quadrants – by acting paternalistically and ‘doing things for’ people (attempting to support them, but in your way rather than theirs), or slipping into punitive mode and ‘doing things to’ people (where they become the object of action rather than an active subject). I see Host Leadership as working towards a very similar objective. Hosts and host leaders strive to reach out and engage people with their active co-operation, rather than compelling participation. Once engaged, though, the developing relationship allows structures to be used which help all involved to know where they are with each other. In the same way, accepting an invitation to visit someone may mean using their ‘house rules’. These structures can serve a controlling purpose, but they are entered into as part of a bigger process rather than as a means of obtaining submission. This idea of acting WITH people, rather than for them or on them, is central to host leadership. And yes, occasionally we might want to do things for people (when they can’t do them themselves) – but with their permission and agreement, rather than from our own assumptions. It’s nice to help an old lady across the street, but first check that she wants to go! I look forward to building on this initial connection with restorative practices in future blogs and articles – it’s an exciting prospect. Please add your reactions, comments and connections below, as well as thoughts on particular angles and connections between these fields. Host is turning into a favourite leadership book! Posted on 2 November, 2016 . 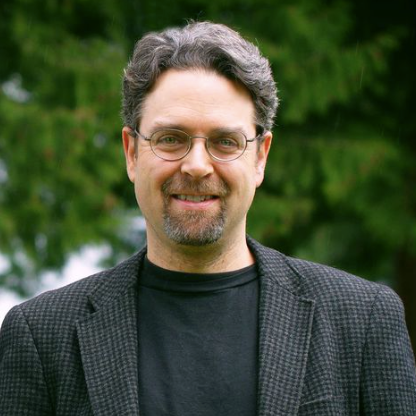 On our twitter account @thehostleader recently we had a tweet from Barry Overeem. Barry has listed his six favourite leadership books – and Host is one of them! Thank you Barry. Barry’s six favourites also include! What are YOUR favourite leadership books? Host author Dr Mark McKergow is a fan of Obliquity by John Kay – not totally a ‘leadership book’ but a very good look at what to focus on and what to approach sideways. Add your suggestions and comments below – and we’ll tweet about it! Posted on 24 August, 2016 . Team GB (as the UK national team is rather oddly known at the Olympics) have had an extremely successful games in Rio. 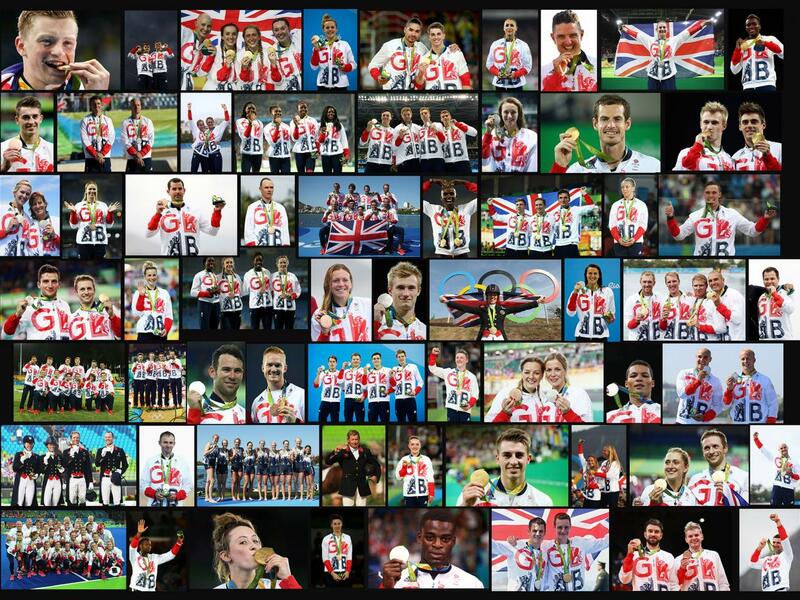 A record medal haul, success in an unprecedented number of sports, London 2012 winners defending their Olympic titles, new stars emerging – it’s all gone very well. And why? This Guardian article by Owen Gibson lists five factors: Lottery funding, a no-compromise culture, the high-performance system, new stars emerging,… and team spirit. From the perspective of host leadership, building team spirit is a key element – engaging these rugged individuals together is not straightforward, particularly when they have spent years training either alone or with team-mates from their discipline. It seems that one key is the experience of the patriotically-named Mark England, the ‘chef de mission’ (head of the whole delegation) since the Salt Lake City winter games in 2002. England has been working to engage the larger numbers in various ways, such as making more of the pre-games training camp to help the athletes meet and bond. From a host leadership perspective, two things are mentioned that are particularly interesting. Firstly, all the team members are now given their official Team GB kit at special ceremonies. This is an excellent example of using the Gatekeeper role in host leadership, defining boundaries and welcoming people across them. If you want to be part of the team, you participate in the ceremony of joining it. This kind of event can be seen as a sort of ritual, a marking of transition, where both the person concerned and the rest of the team can see them publically joining and committing to the team. Host leaders know the power of these welcoming events and take care to organise and execute them well. Rituals like this have until recently felt a bit alien to the British sensibility. We have watched other nations like the USA and Canada swearing allegiance to the flag and that sort of thing with a sense of ‘oh come on, don’t take yourself so seriously’. However, it’s becoming increasingly clear to even the self-deprecating Brits that there is a value in marking transitions seriously and publically – we started welcoming new citizens the country at ceremonies in 2004. Although many of my fellow countrymen and women still find the idea toe-curling, the ceremonies are popular with the new citizens and their families who feel welcomed and included. Along with this, Owen Gibson mentions that senior and world-famous athletes like tennis star Andy Murray, top golfer Justin Rose, cycling hero Sir Bradley Wiggins and rower/nost decorated female Olympian Katherine Grainger all get involved, be there, talk with the younger athletes and set a good example is also vital. In host leadership we call this Co-participation; if you want to lead something, you need to find ways to join in with it as well. It’s not good telling everyone to participate (in for example, a ceremony of welcome) and then not doing it yourself – one rule for the leader and another for everyone else won’t build the kind of engagement and relationships that are important. And this goes for the team in the office or the factory floor as much as in the Olympic Games. Come and find out more about the leadership roles of Gatekeeper and Co-participator, as well as many other aspects of leading as a host, at our first Host Leadership Gathering in London from 14-16 September. The main gathering is on Thursday 15 September, preceded by an introduction workshop and followed by a day of Open Space where everyone is welcome to raise questions and topics, as well as getting live help with leadership challenges. Details at http://hostleadership.com/gathering, booking at http://hostleadership.eventbrite.co.uk, download the programme at http://tinyurl.com/hostgathering2016. Posted on 15 August, 2016 . One of our six ‘roles of engagement’ for host leaders is the Gatekeeper – the one who sets boundaries, welcomes newcomers over the threshold and perhaps (in extremis) ushers them out when they’ve overstepped the mark. One strong tip which emerged in our research was the power of leaders being located near the front door; being aware of comings and goings, being in a position to say hello and goodbye, being able to meet people are they arrive, engage with them and help them understand the ways things work here. These are all key elements of leading as a host, and being near the door makes them much easier to achieve. Mark recently visited Abbotsholme School, where he was educated (some might say) in the 1970s. Founded in 1889, Abbotsholme has always had a reputation for educating the whole person rather than focusing exclusively on exam success. Then and now, elements such as music, art, drama and outdoor education played key roles, with the whole school heading off (not all together!) for hikes and expeditions on a regular basis. The school has always had its own farm, run in part by the pupils, which recently featured on the BBC Countryfile programme. 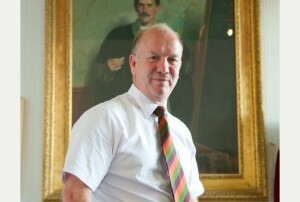 Part of the visit was a tour led by Headmaster Steve Fairclough (pictured below, in front of a portrait of Abbotsholme founder Cecil Reddie), and Mark was intrigued to notice that the Head’s office was no longer in its secluded location upstairs and at the end of a long corridor but is now right next to the front door (see photo). This kind of involvement has been a key to Abbotsholme’s ethos over the past 125 years. Right from the start, all the school was involved in activities such as hay-making, with lessons suspended while the precious hay was gathered. 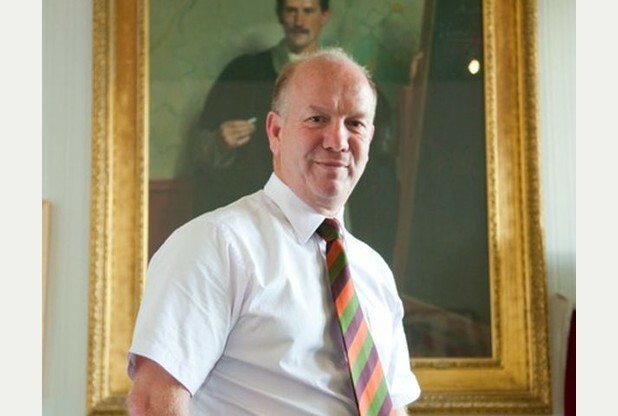 Mark was left wondering that his recognition and development of host leadership might owe something to this remarkable educational establishment – not well known, but the world’s first ‘progressive’ school and still a beacon for balanced education where all – pupils and staff – are encouraged to do their best for others. 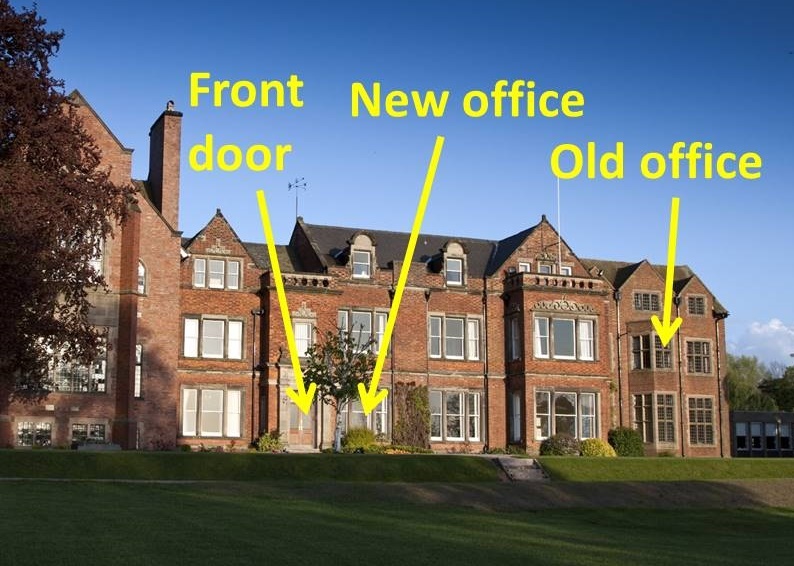 So – where is your office? How do you know who’s coming and going? How can you meet them, engage with them – even make them tea? 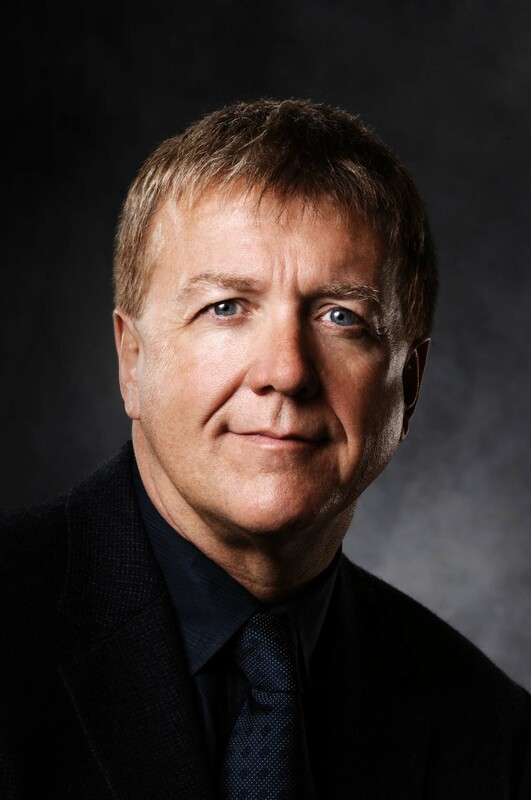 Dr Mark McKergow is an international leadership speaker and teacher, and is co-author of ‘Host: Six new roles of engagement for teams, organisations, communities and movements’ (Solutions Books, 2014). He was a pupil at Abbotsholme from 1972-77. The first international Host Leadership Gathering is happening in London on 14-16 September with a packed programme, speakers and panels, open space discussions and much more. Posted on 5 August, 2016 . I was recently delighted to be contacted by Gervase Bushe (pictured right) and Bob Marshak, widely known for their work on ‘Dialogic Organisation Development (OD)’. They have made a key distinction between ‘diagnostic practice’, which is about diagnosing and curing problems, and dialogic work where the focus is on convening and generating change in conversations. My own work over the past two decades in building Solutions Focus work in organisations is a part of this general dynamic, and has been listed alongside more than 30 other schools of dialogic work on the http://www.dialogicod.net/ website. Bushe and Marshak have also published a new book on Dialogic OD – a must-read for those interested in this topic. I will be reviewing it soon. Gervase was in touch as he had been thinking about what ‘dialogic leadership’ might look like recently. He was very excited to discover our work on leading as a host, and was immediately excited at the possibilities offered by this metaphor. Hosts focus on bringing people together around a topic of joint interest and making sure that the conversations/interactions are supported in ways which help everyone to give of their best, so the connection is a very apt and useful one. The Performance Mindset isn’t necessarily opposed to a Dialogic Mindset. It recognizes that organizations cannot continue to perform without learning. Stuff happens, things change, and people have to adapt, yet in the dominant leadership narrative, learning depends on experts, wise teachers, and heroic leaders who can show us the way. It does not know how to deal with situations where no one knows the “right” answers or where ”best practices” are not applicable. The Performance Mindset knows very little about how to inquire into collective experience in ways that catalyze the emergence of new ideas, processes, and solutions by aligning with and amplifying the untapped wisdom in the organization. They then contrast this with the Dialogic mindset – the idea of a leader who focuses on the power of narratives and conversation as the fabric of social and interactional change. Particularly in complex and VUCA (volatile, uncertain, complex and ambiguous) environments, nobody – not even the leader – can know enough to solve all the problems. Rather the leader’s role is to bring together those involved, so they can make better progress than they would have done separately. This leadership works to enrich social networks so that people with similar motivations and ideas can find and support each other in order to take on complex conditions and adaptive challenges through self-initiated actions and small experiments. Rather than vet ideas, manage projects, check implementation plans, and so on, the Dialogic Mindset wants to encourage the emergence of new ideas and possibilities fostered by different narratives and meanings that challenge the status quo. In this rich and carefully structured paper, Bushe and Marshak look not only at seven key elements of a dialogic mindset, but also at the key element of holding anxiety in uncertain environments and also the ‘ego development’ needed by leaders to embrace this concept in practice and set aside their need to be the controlling centre. They quote research on this which aligns with the work of our own Stephen Josephs (co-author of Leadership Agility) that show that only 15-20% of adults develop to a stage where they may be prepared to work in this way. I propose that the powerful-but-everyday metaphor of leading as a host may offer a mindset expanding route not only for those already at such a level, but also those on the way. The paper is very well worth careful study – download it now. 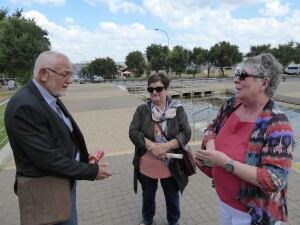 I am hoping to get together with Gervase Bushe on his next visit to the UK – it will be very interesting to see what further connections and possibilities we can produce in our dialogue. BUSHE, G.R. & MARSHAK, R.J. (2016) THE DIALOGIC MINDSET: LEADING EMERGENT CHANGE IN A COMPLEX WORLD. ORGANIZATION DEVELOPMENT JOURNAL, 34:1, 37-65. Posted on 1 July, 2016 . 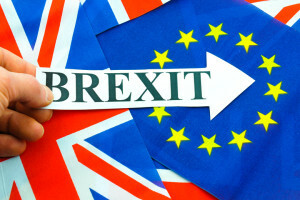 Well, what a week it’s been with the UK voting narrowly for Brexit following a confused and heated campaign generating more heat that light from both sides. So many things have changed at a stroke – aspects of live which were formerly assumptions have been brought to uncertainty, taken-for-granted freedoms like the right to love and work anywhere in the EU are in question. Sadly, racist attacks are reported to have increased by 500% since the vote. As I write this on Friday 1 July both main UK political parties are having leadership crises, the winning Leave campaign has no plan, and the only British politician coming out of it with any credit is Scottish National Party leader Nicola Sturgeon. Nicola Sturgeon seems to me to be showing excellent host leader qualities. She knows which direction she wants to go (Initiator role). She has reached out to others in the EU and gained important meetings and conversations (Connector role). And above all she is stepping forward with confidence at a time when most other British politicians are acting like rabbits in headlights, knifing each other in the back and generating huge uncertainty. Acting confidently – even when you don’t know what’s going to happen – inspired confidence in your ‘guests’ and followers. 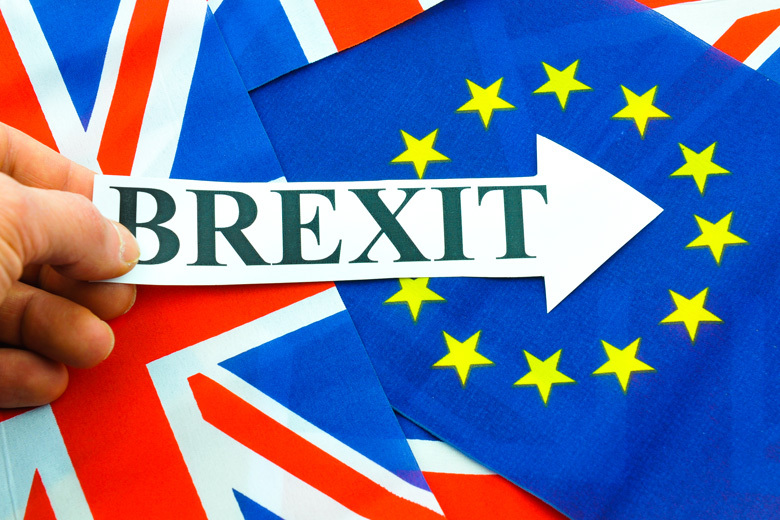 It has been said that the result of the Brexit vote came as a shock to both sides, and may even be generating a mental health crisis as people have their realities rocked. What can we do at this time? It seems to me that wherever we are in the UK or in the wider world, this is a moment for small acts of kindness and reaching out to others in ways great and small. This excellent list arrived in my inbox from Sunday Assembly founder Sanderson Jones. Sunday Assembly is a network of secular congregations that meet to celebrate life, and this list could be used by anyone – of any faith or no faith – in the days ahead. Smile at someone in the street. They probably want to know they’re in a world of love and kindness. Don’t hate people who have different opinions. They’re just humans who want the best in a complicated world. Create connections outside of your tribe. Tribalism enflamed the passions we’re feeling now. Hearing people that agree with you is great but more important to listen to those that don’t. Remainers, if you’re feeling pain after the vote, remember this is the pain that many of the Leavers felt before. Leavers, the result has shocked a lot of Remainers, don’t kick them when they’re down (and out). If there’s going to be a ‘culture war’ it is better to find peaceful solutions than to take up arms. Be grateful: you live in one of the richest, most peaceful, most advanced countries the world has ever known. Be positive: we got through two World Wars, the Suez Crisis and losing Eurovision. We will get through this too. Sure, get politically active but you can be apolitically active too. The new knitting group can be more powerful than the sword. In every borough, county and street in the country there are people who disagreed with you. Make their world better however you can. Come up with a new cultural, social and economic vision for Britain that everyone can get behind (this last one’s a biggie). And for those of a more activist bent, Host author Mark McKergow has started a campaign and website at http://projectfarce.uk. He is asking questions, looking for answers, holding people to account and trying to find ways forward in the emerging confusion. Please check it out and on Twitter at http://twitter.com/projectfarceuk.